Circus performance set. Vector illustration.Human and animals design elements. Background with a red curtain and a spotlight with Realistic magic hat with magic wand for magic show . Flat line drawing of clowns with circus attributes. Seamless pattern. Magic trick with handkerchiefs, circus line icon. 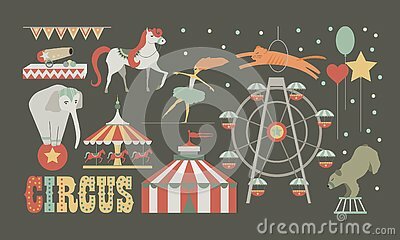 Circus cute symbols set. Shapito show with tent, animals, acrobat and magician equipment. Funny doodle hand drawn illustration. Cartoon hand with Magic Stick.